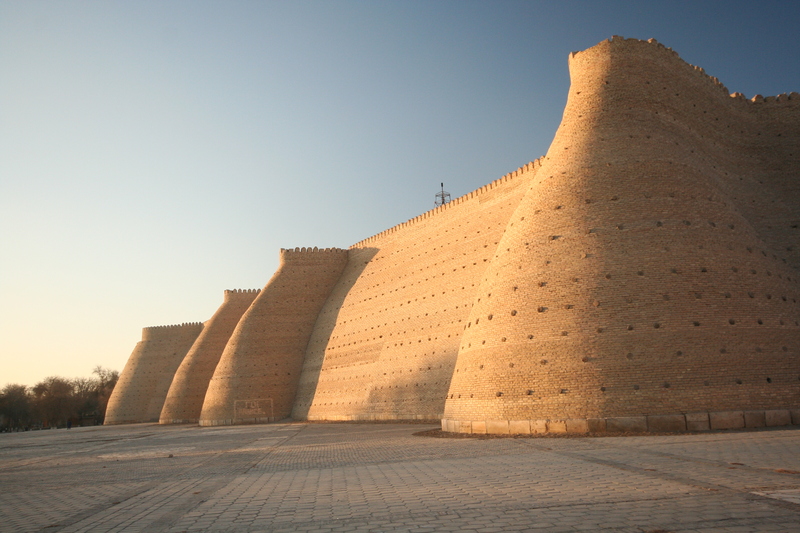 The traditional caravan trading routes through central asia, linking China to Europe and the Middle East, are as exotic as they come, and the Uzbekistani city of Bukhara is first amoungst them when it comes to exotic mudbricked cities, bazaars, mosques and medrasses. In these cities and towns that have been trading with merchants and travellers for millenia, what better way to emmerse yourself in the cultural particulars of the region than to experience the art of buying a traditional handwoven carpet! But in buying a carpet there are many things to consider, such as a strategy that you will need to put in place…..
First of all you need to wander through the bazaars with total indifference to any of the shops, and or their wares. Soon enough a wiley shop keeper will have found out who you are, and will call, unseen from inside his shop “we have very special prices for Australians today”. Then a porty fellow will emerge from his door with an inviting smile stretching from ear to ear saying “please come inside for a quick look”. Having been suitably impressed with the shop keepers opening gambit, one should follow inside and sit on a couch/seat to await a quick showing of carpets until tastes are determined. Now it is important to point out that Uzbekistan is rather undeveloped and unsophisticated when it comes to carpet shops, rarely will you find a large plush showroom, and if you do find a large showroom it undoubtably will be lit by candlelight, making it feel like you are in a cave. So you must be preapred for small display rooms, but this increases the intimacy of the experience. It is important at this point, before the carpets are all laid out, for the prospective buyer to announce that he has already bought many rugs from India, and turkey, and that you don’t actually need a carpet…as you’ve already got one! None the less you should be aware of the appropriate dimensions for the carpet that you are definetly not going to buy… This ensures you see the ones you want not some mishapen pieces that are of no interest. Choose the colour that will suit your room and then ask questions of the seller such as “is this sheep or camel wool? ?” and, “How many knots per square inch are in this carpet?” The more knots the easier the carpet is to bend and subsequently more supple your carpet will be. It also determines quality and as a consequence price. Then you must turn a corner of the carpet to determine the suppleness of the carpet, you may wish to ask for a magnifying glass to see the knots if one is not offered. It is also pertinent to enquire after the knotting method: one knot, one and a half or double knot. One should also walk upon the carpet to determine how nice it feels. This all adds to your credibility as a carpet buyer. Once a carpet has been chosen, it is recommended that you reconfirm that you definetly don’t need another carpet at the moment. The shopkeeper may then offer to show you his house, and a few more carpets that are similar. One will then get in a car with the shopkeeper to see his house, his carpets, and his carpet making rig. You should ask about the family heritage of the carpet maker if it is a family business. 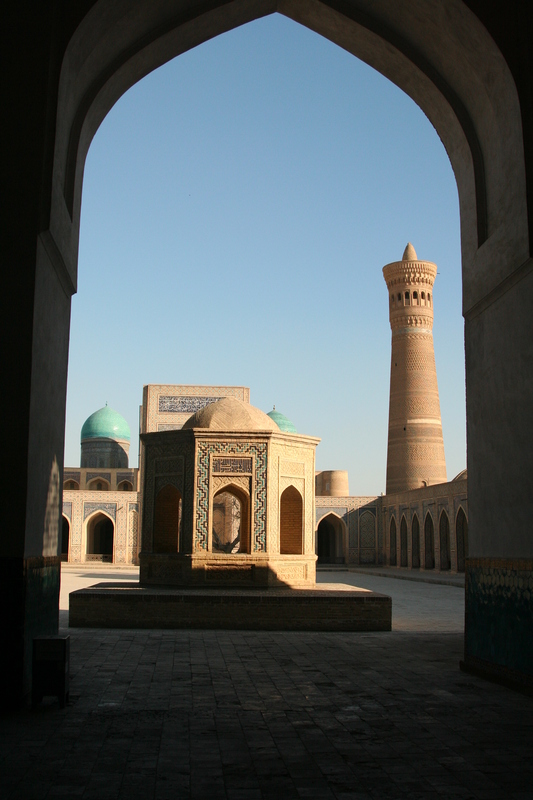 The shopkeeper will tell you his father and grandfather were both carpet makers aswell, and that they are Uzbek/Afghani in heritage (Bukhara is only 250km from Afghanistan). You should then reconfirm that the carpet in the shop was still your favourite, and that you will need another look. Upon return to the carpet shop you should ask if they can freight the carpet to Australia, should you decide to purchase, of course….even though you are not actually in the market for a carpet just now. “DHL, fedex or Uzbek mail? ?” will be asked, at which point you can find the price to Australia……after the carpet has been weighed. I would suggest that you ask now for a carpet price, even though you are not going to buy one just now…..you know as a matter of curiosity, given your experience in the carpet industry around the world. One can now suggest that you will go and may come back later after lunch. After you have perused other carpet shops in town and determined market value of carpets, you can return to the original shop for the price negotiation. Remember to factor in freight and taxes for a total cost. Then set your target price but be flexible, however have walkaway point. It is also important to remember that the people are generally poor, and any money you give will be put back into the local community. It is now that the negotiation begins. The carpet in question will be rolled out once more. It is worthwhile at this point to search out flaws or errors in the carpet. Point these out. Then ask how you will be able to pay for this carpet, and in what currency. Remember that there is an official US dollar exchange and an unofficial rate that is much better. Don’t get caught out. The difference in price is 25%. Once this has been determined, then you should ask for the total price including freight to be negotiated. This will lead to a flurry of phone calls with the DHL agent to cut the external fat out of the price. Once this has been completed, one must announce that “it is still quite expensive” and that you “couldn’t possibly afford to buy the carpet at this price”. You will be told that this is the final price. At this point I would recommend you point out that Australia’s dollar is effectively worthless against the US dollar since the GFC. One should then offer a low price as an alternative. After some umming and arring a slightly cheaper price will be offered. The prospective buyer should then say their thankyous for the seller’s time and get up and leave…… At which point you will be stopped, and a cheaper price reached. Once everything is satisfactory, you can make payment, and take photos of the carpet, this is to ensure that when your carpet arrives by post it is that one you actually bought. 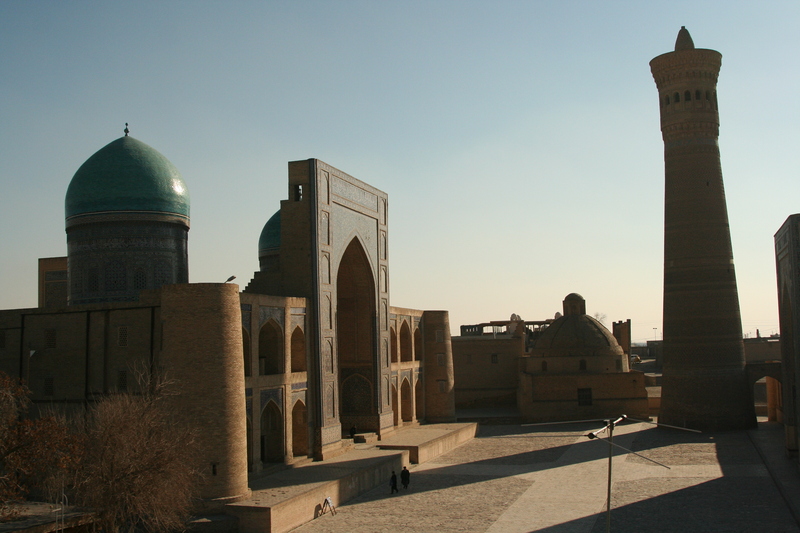 Then you will leave with the carpet seller to the Uzbekistan ministry of arts, culture and sport building, and be admitted by armed military guards. Try not to get too flustered by this show of military power…..The buyer will be ushered into a large room with a big desk for the appropriate minister to sit, and a smaller table in front for the buyer to sit. Behind desk are suitable Uzbek military propoganda posters and happy photos of the relavent dictator in both civilian and military attire. In the room will also be various other men, all suitably fitted out in Mafioso looking suits and black leather jackets. You will then be required to produce your passport, visas and residency status, and then be asked to sign at least 6 different forms………….in cyrilic. Voilà!!! You now own a red camel wool carpet that hopefully will arrive home soon. Great fun buying carpets in Uzbekistan! !